So at this point, it’s clear that big soda and beverage companies haven’t curtailed their marketing campaigns targeted at children and young adults. On the contrary, the marketing towards this demographic has only increased, and the health implications that could result from this have been well-documented. Recently I had the pleasure of viewing a documentary film that seemed quite appropriate to blog about, as it examined the politics and policies of a food campaign (just like the title!). 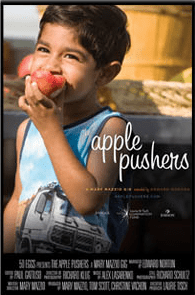 The film, The Apple Pushers, specifically looked at the campaign to increase access to healthy fruits and vegetables in areas of New York City where access to these health foods is difficult (a.k.a. food deserts). I think at this point, it’s common knowledge that consuming lots of sugary beverages, filled with little (if any) nutrients and too many empty calories, is not a healthy food (or in this case, beverage) choice.